Usually, when you think about auto repair, you probably think about the times when you have to take your car into the auto repair shop or when you have to change the oil, but maintenance for your car can be so much more and can include tasks such as cleaning the inside and outside of your car. How does cleaning your car affect you and qualify as regular maintenance? First, keeping your car clean affects your health. Dust, microbes, and other debris can accumulate in your car and eventually in the air. As you may have guessed, because you breathe the air in your car, you will breathe in these particles. Though we will always breathe in dust and other things that are naturally found in even clean air, the amount that you will breathe in due to a dirty car may affect your health and particular health issues such as asthma; breathing in dirty air make you more likely to get sick due to bacteria and germs that are allowed to grow in your car. Cleaning Tip: Be sure to read your manufacturer’s guidelines for best cleaning practices. Use proper vehicle interior cleaners. These will not only properly clean your interior, but these cleaners can help protect your interior from sun damage. If your car’s interior has a grain pattern, use an old toothbrush to get in the crevices. Keeping your car clean and sparkling can have a big impact on your safety and the safety of others on the road with you. A car with smudged, dirty windows can be a big hazard on the road. If the sun hits your windows just right, smudges, bug smears, and other dirt that accumulates “light up,” making seeing out your windows nearly impossible. Having an obstructed view of the road never bodes well for you, the other drivers on the road, and pedestrians. Cleaning Tip: Use window cleaners to keep the interior of your windows clean. To avoid streaking, use a new paper towel or rag for each window and section of your windshield. When you stop for gas, with the squeegees there, work on problem spots on your windshield, and be sure to take your car to the car wash or to get detailed. You must also keep your headlights and taillights clean. Dirty lights can impact your visibility, as well as the ability for others to see you. Cleaning Tip: Wipe your lights with a paper towel or rag to remove excess dirt, and be sure to treat your vehicle to a car wash for best results! Another part of your interior that needs to be cleaned that could impact your safety is the steering wheel and gear shift. Clean any oil and other slippy residues off surfaces such as these to ensure your grip when driving, especially when it counts. Cleaning Tip: For cleaning your steering wheels and grips, be sure to use proper cleaning solutions recommended by your manufacturer. You may be wondering if dirt can have this big of an impact: Trust us, it can. Built-up dirt and grime can affect your car’s wind resistance; dirt and road grime, though small in size, can create a slight pull, causing your car to get less than optimal gas mileage. Cleaning Tip: Take your car to get detailed or to the car wash regularly to effectively remove the dust and other debris that naturally build up on your car. Keeping your car clean is a means of protecting the investment that is your car. Not only can built up dirt and grime scratch the paint on your car, but some of the chemicals that your car encounters on the road can corrode your vehicle’s under and outer parts. Cleaning the interior of your car can greatly affect its resale value. Stains and other debris that are allowed to stay on seats and upholstery can become permanent if not removed, and dirt and trash can scratch the interior and also create discoloration. Cleaning Tip: You can clean and care for your own car using proper vehicle cleaning products or get your car detailed! Interior and exterior detailing can keep your car looking good and feeling like new. Exterior detailing means cleaning the visible areas of your car, as well as the underparts of your car, including your wheels which do need cleaning and conditioning. 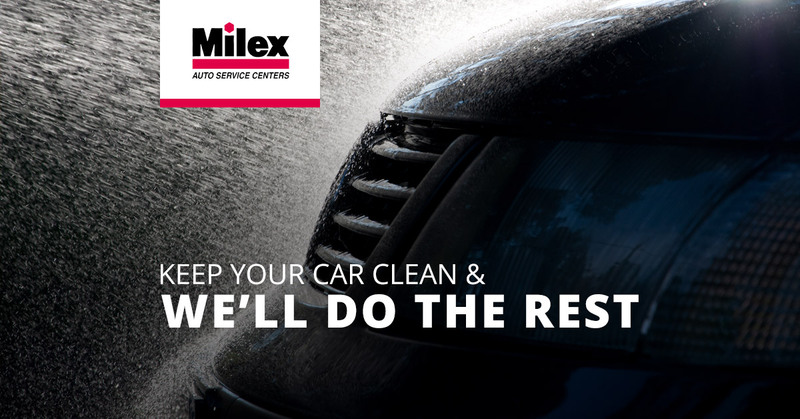 At Milex Auto Service, your local auto repair shop in Tucson, we can take care of all other needs your car may have such as regular maintenance, repairs, and troubleshooting. In addition to provided high-quality and professional auto repair, we also offer free shuttle service to and from your home, work, or wherever else you need to go with early bird drop off and after hours pickup. Also, we provide free towing within Tucson (ask us about our conditions and limitations) and a lifetime warranty on most of our repairs. See our Service page for more information on the auto repair services we provide and contact us for an appointment today! To keep your vehicle running properly at all times, we offer a full range of Auto Repair services in Tucson, AZ that are carried out by our certified experts. We guarantee all of our work and know you'll be happy with the outcome. To learn more about our auto repair services, savings available today, or ask us about about potential problems with your vehicle; feel free to Contact Us today! We are happy to answer all of your car repair service questions at any time.